Most students, faculty, and staff commute to campus by car. The number of auto thefts on campus may seem small, but to the Department of Police Services, even one auto theft is too many. Knowledge is the key to preventing this crime. Want to protect yourself? Take a look at our crime prevention tips listed below. Remove your keys and reduce your chances of becoming an auto theft victim by up to 80 percent. 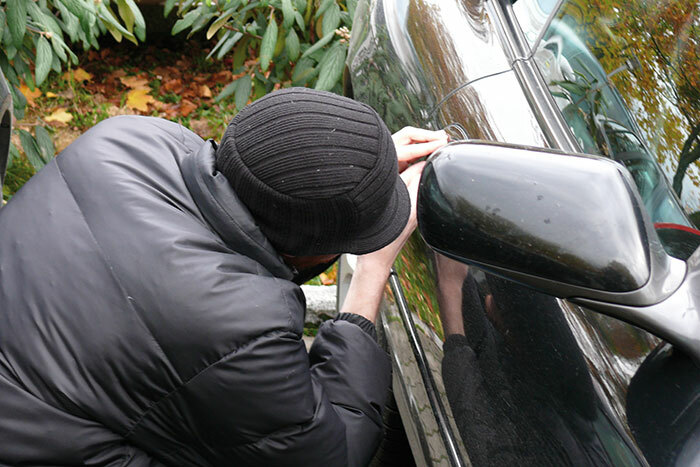 Always lock your vehicle, which reduces your chances of becoming an auto theft victim by more than 60 percent. Roll up your windows to reduce your chances of auto theft by up to 20 percent. Avoid leaving your car in unattended parking lots for a long period of time. A busy place offers a natural deterrent to auto theft. Install an anti-theft device to deter those thieves looking for free transportation. Engrave an identifying number in a hidden place. Placing these identifiers on the car and any valuable components will help the police identify recovered property. Don't leave any valuables in sight; they are likely to tempt a thief. Don't hide spare keys; they can be found. Never leave your car running while it's unattended. Approximately 29,750 automobiles had university parking permits in 2014, and 36 auto thefts were reported on campus between 2012 and 2014. The most frequently stolen vehicle on campus during that time was the Honda Accord, just as it was from 2010-2012. If you assumed that you couldn't become a victim of auto theft because your car was old, think again! Cars stolen on campus during that time were as old as a 1983 Kawasaki motorcycle and as new as a 2013 Ford F-150 and a 2014 Sym Moped. RebelSAFE is the official mobile safety app of UNLV. Among the many features of the app to help keep the campus community safe, users can contact UNLV Police dispatch directly from the app if they witness a theft-in-progress as well as submit a crime tip if they become aware of information to help recover a stolen vehicle. There is also a Motorist Assistance function that allows the user to contact UNLV's Parking & Transportation Services directly. To download the free app, visit iTunes or the Google Play Store. Locking your bicycle doesn't guarantee that it won't be stolen, but it certainly makes theft less likely. Not locking your bike is an invitation to steal. Don't leave your bike on campus without your lock. Lock your bike to an immovable object or bike rack. Use a solid metal U-shaped lock for extra protection. If you have no way of identifying a stolen bike as yours, you probably won't ever see it again. If you record certain information, you'll have a better chance of recovering your bike. Record the serial number, make, model, size, color, and value. Keep the information in a safe place. Engrave your driver's license number in a secret area on your bike. Register your bike with UNLV Police Services. All your bike information will be on file with UNLV Police Services. UNLV Police Services can easily contact you if your bike has a registration decal. To register your bike on campus, bring your bike to Police Headquarters, participate in one of Police Services’ laptop and bicycle registration events, or complete the online form below. Check our events page for more information on property registration and other events as they are scheduled. RebelSAFE is the official mobile safety app of UNLV. Among the many features of the app to help keep the campus community safe, users can contact UNLV Police dispatch directly from the app if they witness a theft-in-progress as well as submit a crime tip if they become aware of information to help recover a stolen bicycle. Users can also register their bicycle directly from the app. To download the free app, visit iTunes or the Google Play Store. From 2012 to 2014, campus burglaries of classrooms, dormitories, and employee offices accounted for 77% of all the burglaries reported on the university's campus. The burglarized items included computers, classroom projectors, and minor items such as compact discs and pocket change. Securely lock all windows, doors, gates, and garage doors. Ensure that all sides of your home or workplace are well lit. Make your home look occupied at all times with a few inner lights burning at night. Automatic timers can be used to vary the on/off pattern of interior lights when you are away. Install deadbolt locks in doors and locking devices on opening windows. Consider installing a burglar alarm and use signs to indicate the presence of a dog or alarm system. Engrave or mark valuable property for identification. Get to know your neighbors and coworkers. When possible, join or start a neighborhood watch program on your street. Walk and jog with a friend. Hold your purse, briefcase, and other belongings close to your body. Place your wallet in your front pocket instead of your back pocket to discourage pickpockets. Police Services administers a property registration program on campus with events held throughout the year. Register your personal property, such as laptops, cellphones, bicycles, and other valuables, so that UNLV Police will be able to quickly return it to you if we recover it after it is lost or stolen. Check our events page for more information on property registration and other events as they are scheduled or register your equipment with the online form below. Go to a well-lit building, location, and/or public facility (preferably where there are many people). Notice and remember as much as possible about the person following you so you can provide a description later. Don’t resist. No amount of money is worth taking chances with your life. If the robbery occurs on campus, contact the UNLV Police emergency dispatch line at 702-895-3669. If the robbery occurs off-campus, call local police by dialing 911. Try to give a description, including approximate age, height, and weight as well as details on hair, clothing, jewelry, tattoos, and anything that is noticeable. Observe the direction and vehicle(s) in which the suspect(s) flee. Resist any temptation to follow or capture the suspect. If you are in a building, lock the doors to prevent the suspect’s return. Promptly report the crime to the police. Protect the crime scene location until police arrive to search for evidence. Write down a description of the suspect(s). Resist the temptation to collaborate your description with other witnesses. The police will resolve differences in descriptions later. RebelSAFE is the official mobile safety app of UNLV. Among the many features of the app to help keep the campus community safe, users can contact UNLV Police dispatch directly from the app if they witness a theft-in-progress as well as submit a crime tip if they become aware of information to help recover stolen property. To download the free app, visit iTunes or the Google Play Store.